Leading Supplier of Alarms and Fire Systems in Ireland. Based in Kildare, service customers nationwide. MacAlarms have been supplying burglar alarms and security systems to Irish homeowners for over 20 years. We have installed alarms in approximately 3,000 homes nationwide. When you get a Mac Alarms burglar alarm or security system you get our years of expertise and security advice include as part of the service. Mac Alarms can give you an instant Online Quote for your burglar alarm. Answer a few quick questions and get your quote immediately. All quotes are valid for 30 days. The number of burglaries around the country has increased by nearly 25% in the space of two years, accord­ing to figures from the Central Statistics Office. The dramatic rise is a cause for concern for gardaí as the amount of more serious aggravated burglaries has also shown a similar increase. Protect your family, your home and your belongings with a Security System from Mac Alarms. Call 045-441479 today! Your alarm MUST be serviced regularly. If you don't you run the risk of a system failure or worse. 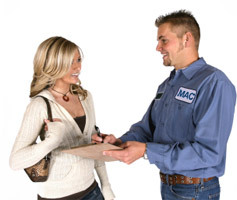 We will service any alarm even if it was not installed by Mac Alarms Ltd!